In the future, HAM stands for Horticultural-Approximate Meat. That acronym was given to the synthesized protein created as a byproduct from the waste recycling apparatus of the Aurora by the Crew, which comes out of the food processors onboard. Alterra Scientists discovered that it is completely digestible and totally indistinguishable from SPAM. Probably synthetic ham and cheese. We have that in our world today, so it's not all that strange. 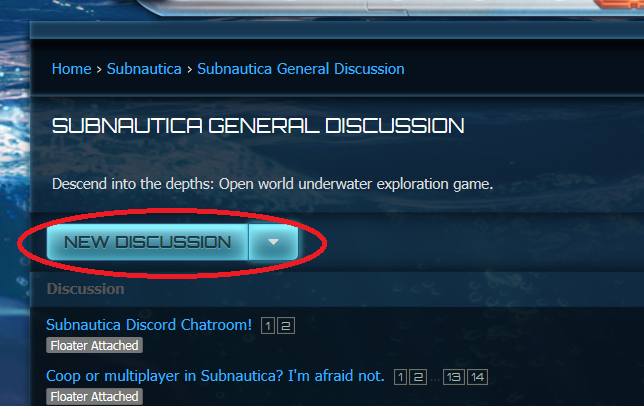 Can you please renew the Subnautica Discord? Why isn't there a topic "Introduce yourself" if there is a one post minimum before opening a topic? They are in early stages for Ps4, they only said they're 90% sure they'll do it. Xbox1 isn't even to full release yet, as they still have optimization to do on that platform. I wouldn't expect any further announcement on Ps4 until sometime after Xbox1 release is ready. Also, in 'Today's Menu', cottage pie is served with beef and gravy. yupi REALLY hope you guys can make this work on ps4 cuz if my favourite game is not on my console i will actually KILL myself! may I please ask the estimated date for subnautica to come out on the ps4? I really appreciate the devs working on it! @subnautica1434 Maybe sometime within the next few months. It most likely is this year, but when is foggy. It really depends on when they finish the XBone version. how can i be unbanned? If you got yourself banned, you screwed up. There ain't no goin' back. Hi!... New here... I wanted to make a topic on the suggestion board, but since i have to post something first, i will post here. Is there any way to make possible install bulkhead on automatic connections between compartments? I just build a new base, a more compact one, stacking Multi-purpose Rooms, but now i realize that i can't install bulkhead between compartments. The bulkhead is one of the easiest way to increase the hull integrity. If there any way to make it possible, that would help a lot. Build a hallway. Then add bulkhead. I need to post 1 time and wait one day before i can make a topic. Thats my post. you can only make threads when you've made enough comments, have been a member for long enough, etc. @manozika7 Does it have this button? If not, we'll want to page a moderator for help. It is possible they had to change the delay, to account for smarter bots. I cannot seem to access the Discord server due to an expired or invalid invite. It just disappeared suddenly. Can someone please tell me if I was banned and if so, why? I do not remember doing anything that would warrant a kick/ban. User is Beta#4941. "This instant invite is invalid or expired." This is even after manually typing in the link. Couldn't find a topic to indroduce myself so I'll start here. Really loved Subnautica, from the mesmerizing exploration experience to its solid and deep plot. I Bought Below Zero. Some deep analysis in this forum about Below Zero's plotline - and how to help the devs evolve it - made me wanna register.